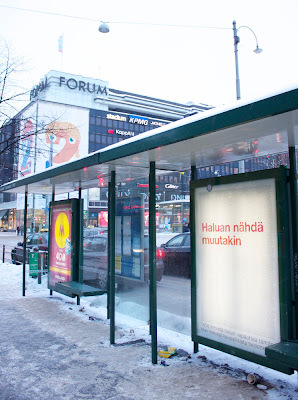 I was recently made aware of a project called "I want to see something else" out of Helsinki. Started by Elissa Eriksson as part of her MA final thesis, the project used Facebook to crowd source money from 1458 people to purchase of 21 bus shelter advertising spaces for one week at a total cost of 5896.66 euros. While I applaud the effort and the desire to reclaim public spaces from commercial media for public concerns, I cannot help but see only the worst in this project. Maybe this was Mrs Eriksson's intention all along but I am appalled by the fact that we now live in a world where one must buy back public space from private companies in order to have a forum for open public communication.